The use of tools was originally thought to be a skill only possessed by humans. It was in fact considered the defining characteristic that separated us from other animals. However, it is now known that many species of animal use tools. The key to identifying tool use is to understand what constitutes a tool. Researchers of animal behaviour have arrived at different definitions including: ‘An object that has been modified to fit a purpose’ or ‘An inanimate object that one uses or modifies in some way to cause a change in the environment, thereby facilitating ones achievement of a target goal , ‘the use of physical objects other than the animal’s own body or appendages as a means to extend the physical influence realized by the animal’ and ‘an object carried or maintained for future use’. As with many other animal behaviours, the lack of a clear and agreed definition of tool use can make it difficult to identify. 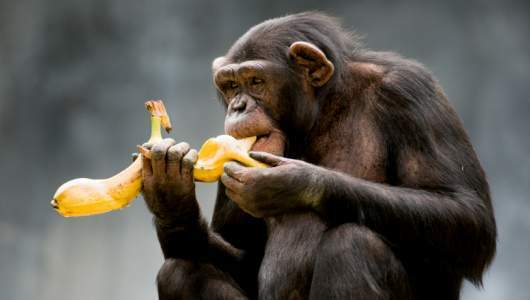 Tools are used by some animals, particularly primates, to perform simple tasks such as getting food or grooming. Opposable thumbs are a benefit in tool use, though creatures without hands have managed to use other body parts to their advantage, notably the mouth. Some animals, such as sea otters, have a favourite tool that they carry about with them. Others find nearby articles such as stones, twigs or thorns, which they use and then discard. There is a link between tool use and large brains. Tool use requires some level of intelligence and implies an animal has knowledge of the relationship between objects and their effects. Advanced use comes about when tools are used in combination, as when chimps use both a hammer and an anvil to crack kernels. The animals that make the widest use of tools are humans, who have developed mechanical, electric and electronic tools for multiple purposes. However tool use in other animals is much more common than previously thought. Tool use has now been observed in primates such as chimpanzees, orangutans, gorillas, capuchin monkeys and gibbons, dolphins, elephants, otters, numerous bird species such as New Caledonia Crows, rooks, parrots, and octopuses. Hauser M 2000. Wild Minds: What Animals Really Think. Henry Holt and Company, New York. Jones, T. B and Kamil, A. C 1973 Tool-making and tool-using in the northern blue jay. Science 180, 1076–1078. Finn J. K, Tregenza T and Norman M. D 2009 Defensive tool use in a coconut-carrying octopus. Current Biology, Volume 19, Issue 23, 1069-1070. Goodall J 1968 The behaviour of free-living chimpanzees in the Gombe Stream Reserve. Baillire, Tindall & Cassell (London). Boswall J. 1977 Tool using by birds and related behaviour. Aviculture Magazine. 83, 88–97.